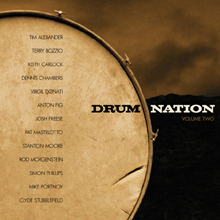 Various Artists - "Drum Nation: Volume Two"
I reviewed the Drum Nation Volume 1 CD and that was fantastic. My 6 year old daughter, I just bought her her first stereo with a CD and cassette player and the first CD she wanted to hear was Drum Nation Volume 1. Is that cool or what??? Anyway, while Volume 1 was solicited tracks, Volume 2 mostly comes from the Magna Carta vaults and features such drummers as Terry Bozio (again), Tim Alexander, Dennis Chambers, Keith Carlock, Josh Freese, Anton Fig, Pat Mastelotto, Mike Portnoy, Clyde Stubblefield, Vigil Donati, Simon Phillips and Rod Morgenstein. One thing that is so cool about these Drum Nation CDs is that it is not just about the drums, you have some totally amazing guitar, keyboard and bass players as well. The opening track by Mike Portnoy is more ripping fusion guitars that really stand out rather than the outstanding drums. So what tracks did I like the best…. Terry Bozio is always amazing but I also like the Dennis Chambers track, Virgil Donati's speed metal like drumming on Space Martini, the very bizarre Tim Alexander track, Josh Freese's Baby Faced Assassin. Hell, it is all really great stuff. If you like jazz ,fusion, and rock with some killer imagination, you can't go wrong here!